Google offers its users loads of different online services and tools for different purposes. It has done so with more or less success depending on each case but amongst those that have been a hit, we have to mention its mapping and cartography apps. 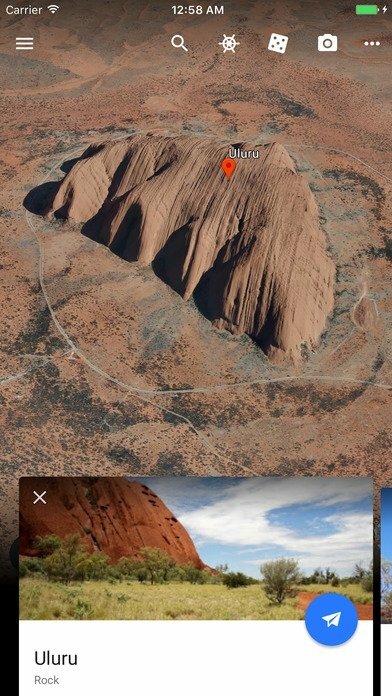 Google Maps and Google Earth are two applications with different uses that are here to satisfy the user's geographical curiosity. Who hasn't spend time exploring the world searching for one place or another looking for that village that we've always wanted to visit? 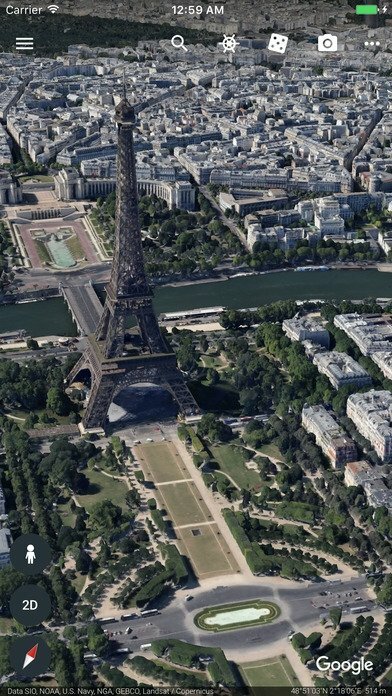 That's precisely what Earth offers us: the app for those people used to viewing the world through photos because they couldn't travel there physically now provides us with an excellent tool to satisfy our curiosity. By means of aerial photos, satellite images and geographical information based on GIS models, it offers us a very faithful representation of the entire globe. It allows us to explore any place on the planet through a simple navigation system (swipe your finger and zoom into your own liking). We can travel from the Rocky Mountains in the USA to the paradise beaches of Bali, with a stopover at the Antarctic, in a matter of seconds, with access to images, topographical information, and even Street View wherever available. Guided search tool to find any place on Earth: type in the name and receive suggestions in real time. Simple navigation system: swipe your finger to move around the map. Discover information about any place, region, monument or point of interest with cards that make use of resources of the likes of Wikipedia. 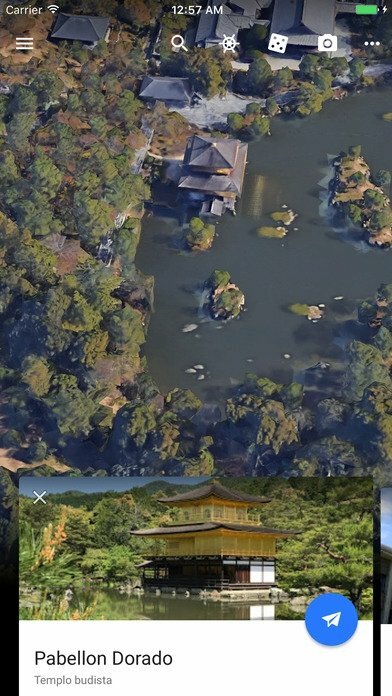 Choose between a 2D and 3D view. Find your bearings and explore places by rotating the position of the compass. Travel randomly with the Feeling Lucky? mode. Try your luck visiting anywhere around the world. 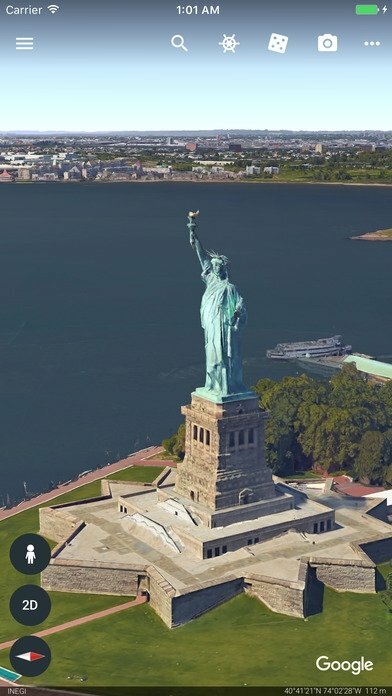 Explore the streets of London, New York or Washington DC with Street View. Save your own list of favorite places. Take screenshots of the places you visit and share them by email or chat and instant messaging apps as if they were postcards. Share your location with the app. Share locations by sending links to your contacts. 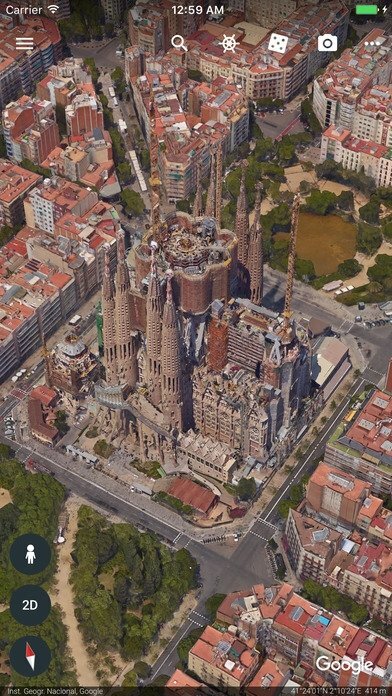 This is the version of Google Earth for iOS that we can use on devices such as iPhone or iPad. Nevertheless, it's also available for Android, Windows PC and as a web application so that you can use it from any device without having to download anything.